The Shop menu contains links to the various shop lists, allowing players to buy items for treasure, sell items for rupies, or craft legendary weapons. Daily limits reset at 05:00 JST each day. Weekly limits reset at 05:00 JST every Monday. Monthly limits reset at 05:00 JST on the first of the month. 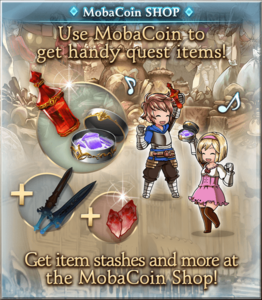 This shop sells items and upgrades for MobaCoin (Chrome) or GranblueCoin (iOS/Android), real-money currency in Granblue Fantasy. 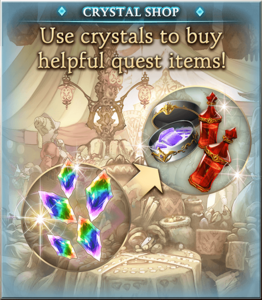 This shop sells items and upgrades for Crystals, the premium currency in Granblue Fantasy. The treasure shop has 4 subsections: Quest Items, Treasure, Events, and Sell Treasure. This shop allows trading in items found during Main Quests. It includes the Cosmic weapon series as well as coop room boost items. Trade in daily dungeon materials here. Generally, many lower-tier items can be traded for one higher-tier item, or vice versa, though some key links are missing. There is a daily limit on how many of each item can be exchanged. For all elemental items, same elements are used to exchange for one another. Links to event item shops are found here. See specific event pages for details. Certain items found from Coop Quests can be sold for rupies here. Note that Searing Stone, Resplendent Coral, Opulent Amber, and Vortical Pinwheel, are used in crafting Class Champion Weapons to unlock Row IV classes, so it may not be prudent to sell them for rupies. This shop sells items for Renown Pendants and Prestige Pendants. Pendants are obtained from raid bosses with the matching symbol over it. This is where high-end weapons are crafted. For the Arsenal of Heroes see Class Champion Weapons. See Revenant Weapons for details. To upgrade the shop you need a number of 01 weapons that can be obtained from Unite and Fight draw boxes or Rare Monsters. You also need 5 Mithra Animas from Golonzo Island, the 8th island. See the Rare Monster page for details on where any weapon you're still missing after Unite and Fight can be found. Upgrading the shop is only necessary once per account. Caution: Spiked Club and Rainbow Scale Pistol do not have weapon skills. Depending on your Auto-sell settings, they can be unintentionally sold if you are specifically farming for these weapons. See Seraphic Weapons for details. See Xeno Weapons for details. See Bahamut Weapons for details. See Ultima Weapons for details. Trade moons here for various items. Moons are obtained whenever you Draw a character that you already have; Rares give Bronze Moons, S Rares give Silver Moons, and SS Rares give Gold Moons. This is where special pick tickets are redeemed. These are similar to Start Dash tickets and Surprise Tickets. This section also doubles as a list of most characters, weapons, and summons currently available from Draw. Clicking on the portraits will bring up details on stats and skills. Every day at 05:00 JST, when the day resets, players are awarded 1 Journey Drop for every 50 AP spent during the previous 24 hours; any leftover AP carries over to the next day. Journey Drops can be spent in this shop for various 1-hour buffs. As more Journey Drops are earned in a month, players earn a Stage rank for the next month. When stages are calculated on the first day of each month, players earn additional Crystal or draw ticket rewards at random; higher Stages have a higher chance to get tickets, but tickets are not guaranteed. As of 27 February 2019, Stage no longer affects how many buffs or which level of buffs are available to players. All Lvl 1 buffs cost 1 Journey Drop, Lvl 2 costs 3, Lvl 3 costs 5, and Lvl 4 costs 10. Points earned from various non-game cross-promotions are spent here. This shop trades items for Cerulean Stones. See Cerulean Sparks for details. This section of the shop has been removed along with the Defense Order itself. It may return at a later date. Siege Shields earned from Defense Order can be spent here. This shop can also be accessed from the Defense Order main page. 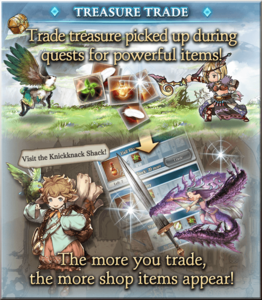 This is where Arcarum summons can be obtained and upgraded. This page was last modified on 4 April 2019, at 17:56.